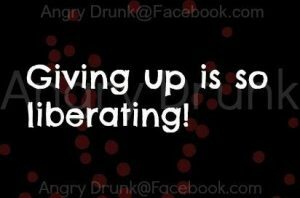 When you hear the phrase, "Give up" or Giving up" what comes to your mind? Is it a good thing? Or a not-so-good thing? To some, it connotes an image of quitting. To others, of letting go. And to a select few, it means "releasing to a higher power." I've been enjoying some audio books by Caroline Myss as I hike. I hadn't really "read" much of her work until recently, so even though the teachings have been out there (and "out there") for a while, it's still "new" to me. Most of the concepts are familar to my own belief system, adding reinforcement to my views. Some of her theories I disagree with (to a certain degree), which is also another form of enlightenment. And a lot of it is adding new vernacular in dimensions that are expanding my brain. Her work on Archetypes has been very helpful, not only for my own self-analysis but also for my writing. I also recently finished her book on Soul Contracts, which I'm sure I'll write more about in a future blog. 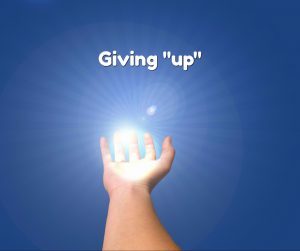 Today's post is about "giving up," which I define as "releasing to a higher power." When you've done all you can do, what other choice is there? As I was hiking the other day, Caroline Myss was talking about the importance – and often impossibility – of "surrender," which, to her, is akin to "releasing to a higher power." She suggests that releasing our will to that of the Divine is the highest goal. It's also the most difficult, she says. In my own personal journey, it's a part of my daily life. Trying to align my will to the Higher Power. "Let me walk in thy will and delight in thy ways" was ingrained in me in my upbringing as an Episocopalian. Another way to say it is "Let Thy Will and mine be one." Or, as I wrote in my Five Reasons Why book, "Let Divine Will Fill My Heart and Guide My Actions." I agree with Caroline that most people spend so much time trying to figure out what they want that they rarely ask "is this in my best interest?" And even if the answer is, "yes," they might get frustrated and confused when "Divine Will" isn't so much fun. Yes, I certainly know that feeling all too well. But I do know that "life isn't easy, and not always fun." (From my children's book). I also know that "easy is boring, like games always won." It's so seductive to follow teachers like Abraham or go to psychics who lure us with "The Secret." "If only I do/say/think ____, I'll have a life of ________ (peace, wealth, health, perfection.)" You create your own reality. Do they realize that "you create your own reality" is in direct conflict with a belief in destiny? And if you don't believe in destiny, then if follows that you don't believe in "purpose." (Think on that for a bit). I personally believe in the confluence of Fate and Free Will. That what happens to us is a reflection of both our pre-ordained destiny and the decisions/choices we make once we're here. And I agree with Caroline: the ultimate in achieving our destiny is to "give up" (or surrender) our will. To God. To Destiny. To Purpose.